Three-time Indianapolis 500 winner and motorsports icon Bobby Unser will serve as the grand marshal for the Brickyard Vintage Racing Invitational on June 16-18 at the Indianapolis Motor Speedway, Sportscar Vintage Racing Association (SVRA) officials announced April 25. Unser won the Indianapolis 500 in 1968, 1975 and 1981, one of just 10 drivers to win “The Greatest Spectacle in Racing” at least three times. Bobby Unser will join many members of his family at the popular event. His brother Al, a four-time winner of the “500,” will compete in the Indy Legends Pro-Am race Saturday, June 17. Other Unser family members competing in the Pro-Am include Bobby’s son Robby Unser and nephews two-time Indianapolis 500 winner Al Unser Jr. and Johnny Unser. Bobby Unser also captured the national driving championship in 1968 and again in 1974. Known as a versatile talent, Hall of Fame member Unser won the 1975 International Race of Champions (IROC) series and scored more Pikes Peak Hill Climb victories than anyone in history. A proven winner in sprint cars and midgets, he also competed in NASCAR, Formula One and sports cars. Among Unser’s duties as grand marshal will be to give the command for the Pro-Am drivers to start their engines. The Pro-Am is a 45-minute race on the Speedway’s 2.439-mile Grand Prix road course. In addition to the Unsers, other top drivers who have filed entries include defending Indy Legends Pro-Am B Production Champion Paul Tracy, Jimmy Vasser, Willy T. Ribbs, Sarah Fisher, Davey Hamilton and Lyn St. James, as well as former overall winners at the 24 Hours of Le Mans, Geoff Brabham and Davy Jones. The cars are racing machines from the “Group 6” SVRA class. As in previous years, that will include 1963 to 1972 vintage Corvettes, Camaros and Mustangs, but also race officials are considering adding other Group 6 marques such as Porsche and Jaguar for variety. 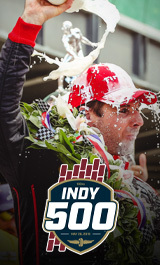 Additional entries in the coming weeks will bring the field to 33 Indy 500 veterans. As in the previous three years, the professionals will be paired with amateur drivers, splitting stints at the wheel at their discretion. In addition to the Pro-Am, there will be a festival of other activities including the Motostalgia car auction, the Hagerty Insurance “shine and show” car corral, a motorcycle homage with vintage motorcycle racing and displays, and 500-plus vintage racers ranging over 100 years of automotive history racing in SVRA Groups 1 through 12. An oval exhibition featuring a race car show of judged competition for the A.J. Watson and Sir Jack Brabham trophies led by IMS Historian Donald Davidson will also take place. Also, for the first time ever, the professional Trans Am series will compete as the Sunday afternoon feature race. Heading the pack will be series champion Amy Ruman, who has won the crown the last two years. This year the Brickyard Invitational will be preceded by a new SVRA event at the Speedway, the World Open Wheel Challenge. This event will commemorate 50 years of Formula Ford and will welcome all forms of open-wheel race cars, beginning June 8. Fans can order Brickyard Vintage Racing Invitational tickets of the event at IMS.com or by calling 800-822-INDY or 317-492-6700 between 8 a.m.-5 p.m. (ET) Monday through Friday. Fans can also visit the ticket office at the IMS Administration Building at 4790 W. 16th St. between 8 a.m.-5 p.m. (ET) Monday through Friday. Kids 15 and under are admitted free each day when accompanied by an adult.